We're a library family. We visit the library several times a month to check out books, for Trevor's book club, for special events, to borrow movies or audiobooks, for Library Roulette... and the list goes on and on. If you were to visit our house, you'd find a pile of library books waiting to be read and a pile ready to go back. We love everything about the library. Now I've come up with a new way to enjoy the library. I'm calling it Library Tic-Tac-Toe. To play Library Tic-Tac-Toe, find a partner and head to the picture books. 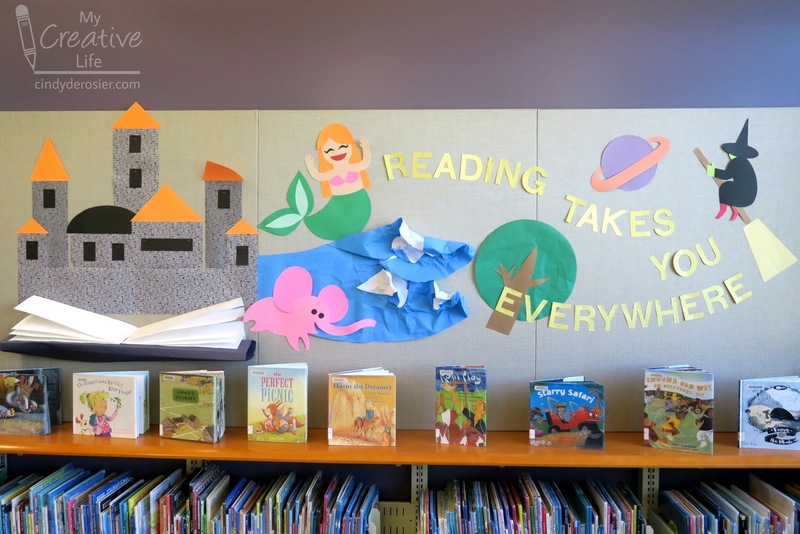 While this is technically the children's area, I have long felt that picture books are for everyone. 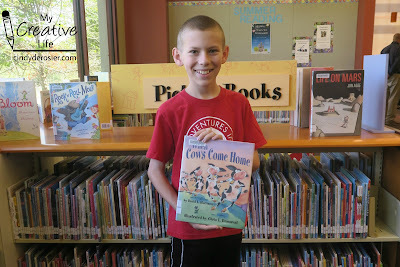 I mean, who wouldn't want to read When Cows Come Home (affiliate link)? 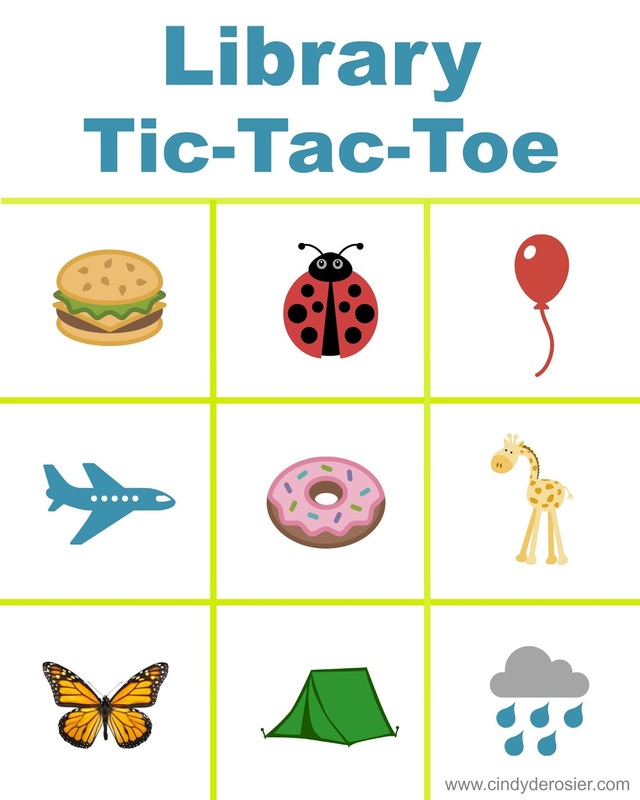 It has a clever rhyming plot and hilarious illustrations. When I was getting my teaching credential, our literature instructor emphasized that no matter what grade level we ended up teaching, we should incorporate picture books into our curriculum. I wholeheartedly agree and regularly used them in my 5th grade classroom. Even though the reading level was too low for most of my students, picture books have so much more to offer: rhyme, rhythm, meter, plot, and pacing, for example. The illustrations are a great jumping-off point for student artwork or to teach art concepts. 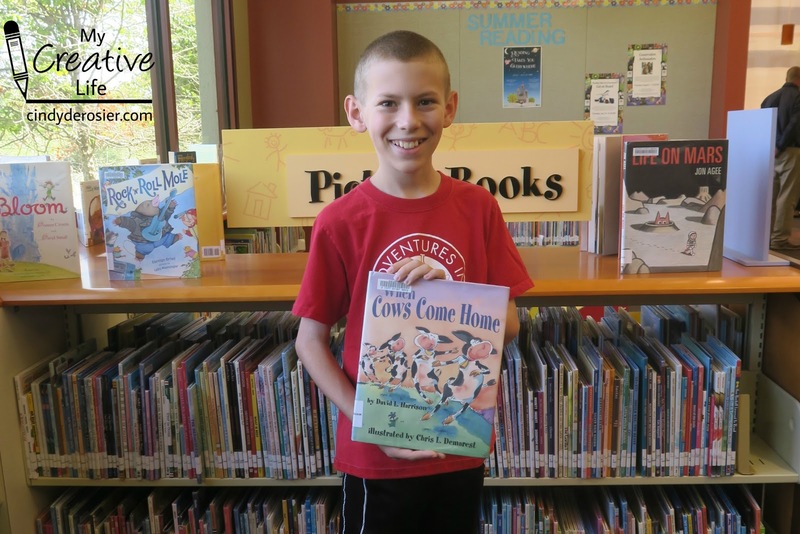 Reading picture books aloud is a great way for kids to become more fluid in their oral reading. 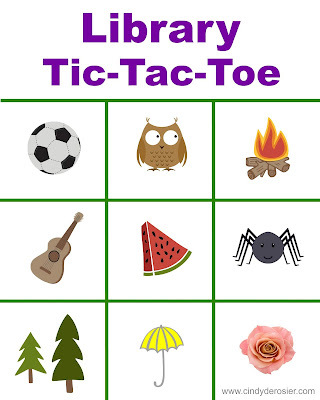 They're great for English Language Learners. Long story short, I'm a fan of picture books, no matter what your age. 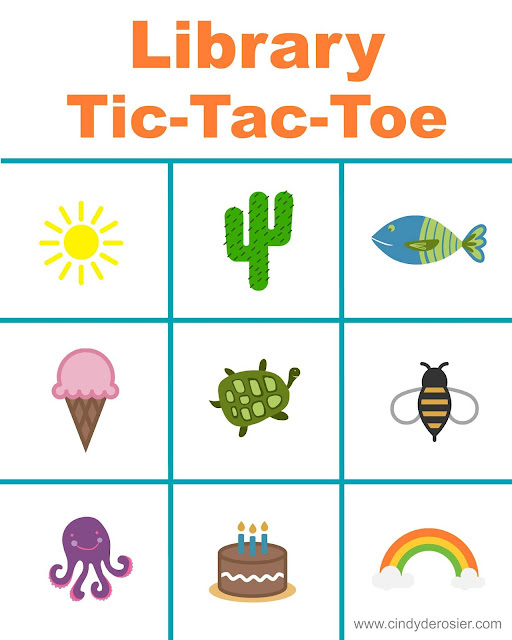 How you play Library Tic-Tac-Toe depends a lot on the age of the child. With a very young child, have the child name the pictures on the paper (vocabulary development) and then work together to find the pictures in books (reading conventions - left to right, prediction based on the cover, turning pages gently to 'be nice to the book', etc.). Introduce the concept of getting three in a row. When you've found three, sit down together and read the books. Repeat as desired! With grade school children, you can play cooperatively (like above) or competitively. To play competitively, agree ahead of time who is X and who is O. 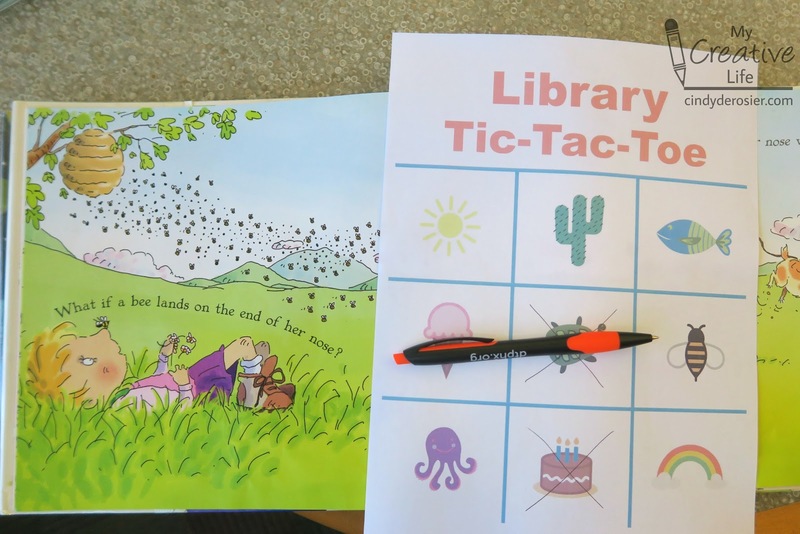 Each person searches through books to find an illustration matching the picture on the tic-tac-toe board. When you find one, mark your space with an X or an O. Three in a row wins. Then sit down and enjoy the books you found. Here, O has found a pictures of bees and will circle the bee on the card. I made the cards using PicMonkey. It was so easy - I just created a grid and dropped their adorable overlays into the spaces. It only took a few minutes per card. Feel free to print my cards and try them out! Or, head over to PicMonkey and make your own. How fun! I just read Itsy Bitsy Spider - the adult version! LOL!! So that probably would work too! Sounds like fun for the kids. I love the library too. What a fun, fun library game! I want to play!!!! And I am sure my 24 and 15 year old daughters would love to play, too. Yes, I totally agree with you - the children's section of the library and book store is our favorite section, and we never leave without checking it out!!! !